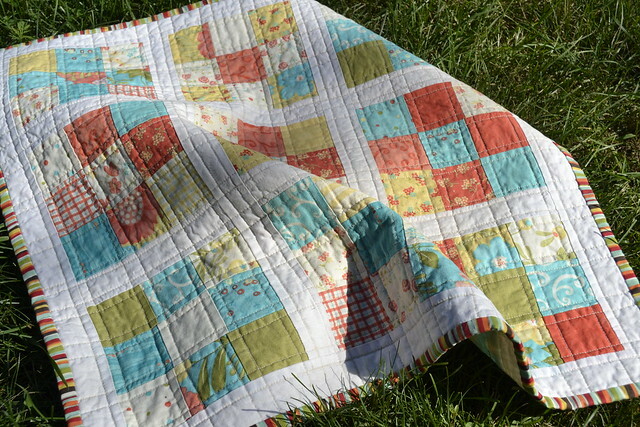 I started quilting at the beginning of 2013. I finished my Rainbow Bricks quilt top, using skills I’d developed while making dresses. Then, I realized, I was going to have to quilt the beast and ground to a halt. I did some research, read some books, tried to figure it all out, but I wasn’t sure where to go with the top. Any ideas I had were so clearly above my skill level. This is adorable… I’m a sucker for a striped binding:-) Your Mother is lucky to have such a loving gift!! !